Startup a word that signifies passion, hard work, teamwork, creativity all at the same time. In our series of Superheroes of Startup today we have team leading lines. An all women Shooting crew who are leaving all men behind them. So let’s hear their journey in their own words!! 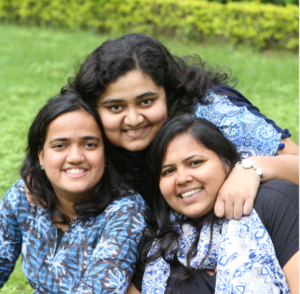 We are an all-women’s team who have experience in both social sector and commercial world. 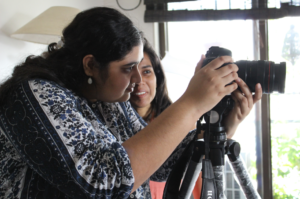 We’re also an all-women’s shooting crew.It’s an exciting journey to work with entrepreneurs, NGOs and companies who are also passionate about their work. We enable individuals/organisations carve a niche for themselves through social media, graphics, website, content, photography, video and workshops. There are some things in life that we choose and some things choose us. Leading Lines was always meant to be. The fire had been burning deep inside us for a very long time.As creative people you need a space that lets your creativity thrive. We realised that there’s never going to be a perfect job. We might as well make one ourselves. We risked the cushion job offers and chose the freedom to invest in things that we are passionate about. We’re enthu-cutlets, digital natives, creative maniacs! A team of four young media professionals with varied backgrounds, skills and experiences, our skills complement that of each other. We are also an all-women’s shooting crew. Besides working together, we also share an extremely healthy rapport. We have been with each other through thick and thin. This understanding brings out the best in us. Aquila Khan – With over a decade of experience in the social sector, she brings to the table sensitivity and deep understanding of social issues. She plays an important role in film making, content creation and scripting. Her Urdu poetry will give you goosebumps! Brenna Ribeiro – Having worked in various roles in different industries, storytelling had always been her true calling. She plays a key role in digital marketing, content creation and business development. Tejasvi Momaya – Having experienced the workings of a business up close at home, entrepreneurship was always an eventual goal. She is the in-house film maker, cinematographer, editor and also plays a key role in business development. Vanessa Carvalho – With a background in advertising, journalism and script writing, you can count on her to come up with the most creative ideas. She plays an integral part in scripting, content creation, designing and is the sound person on shoots. Together we’re an unbeatable creative cocktail! Our services include Content Management, Social Media Management, Video Production, Website Creation, among others. It’s a highly saturated industry and it’s our creativity, strategy and sensitivity that stand out. The margins are very thin. So we try to keep the costs low. We maintain a lean team. The four founders double up as employees. The core business is handled in-house. We believe that our journey has only begun. There are quite a few projects in the pipeline. There’s lot of interesting work coming up – documentaries and collaborations. Expect a lot of out-of-box content from us in the coming months. We’re also proud to announce our second company – Velvet Tales. We tell wedding stories and love stories in style and with a personal touch. You can now get an elegant wedding film without burning a hole in your pocket. If you dream it then do it. Remember that roller coaster ride comes part of the package. Celebrate your successes, learn from your failures. Keep the passion burning!